Welcome to the blog on our new website! This is where we’ll give you plenty of opportunities to see what goes on behind the scenes at Hughes & Kettner. 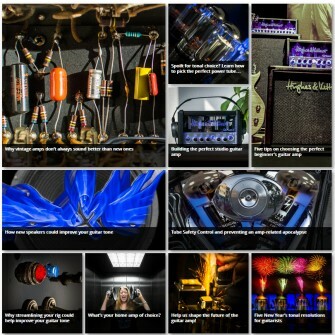 Our people from all over the company will post reports on what they’re up to on the job and show you how those world-famous guitar amps with that trademark blue glow go from our designers’ minds into your hands. We do have some surprises in store for you, but you won’t be surprised to learn that all our amps are developed exclusively in Germany, and some are even made here. This means you can be sure everything we post comes straight from the source. Questions are more than welcome. If there’s something you want to know, go right ahead and ask. And please feel free to share your comments. We’ll do everything in our power to tell you everything you ever wanted to know about the Hughes & Kettner brand in the blog entries on this page. But that’s not all we have to offer. You’re sure to find lots of useful tips that will help you do better and better, exactly what the new generation of Hughes & Kettner amps is here to help you do: Rock on Stage, Play at Home, Record at Night! Rest assured, we’ll be hearing a lot from each other. First published: March 11 2014. Most recent update: March 11 2014. Assistance required with TubeMeister 18. I changed the stock EL84 with Sovtek EL84. Sounds great. Next I did not quite like the sound of the stock 12AX7. So I changed it to 12AV7. Sounded great for a while and then the amp suddenly stopped working. All the tubes are on and all the lights are on. When I checked on the back of the amp head, I can see that both the red lights are on. I switched to a new set of Electroharmonix 12AX7 tubes and then also back to the stock 12AX7 tubes. No change. From the forums I figure that the anode fuse has blown. When I opened the back to check, I found 2 fuses. There was no fuse socket. I had to kind of pry they out. Are these the 2 anode fuses? They seemed intact. A picture of the anode fuse or telling me exactly where it is should help. Thank you. Hi Arun. This is odd – was there any indication that the fuse blew while you were operating the amp, or during your tube changes? Either way, please write directly to the H&K techs on service@musicandsales.com for more advice on fuses and such like. While playing quite loud on my Switchblade 100 (pre TSC) i suddenly lost all output. No warning lights or other indicators, all tubes are lit up. Could the anode fuse cause this condition? It looks intact (no meter) but could be blown. Hi Fuzzy, it could indeed be the anode fuse… Check it and see! Can Tubemeister18 head handle KT 88 tubes? Hello. I have finally got a trilogy amp, but I was a little bit disappointed over the crunch channel. It sounds good when the gain is on 10, but when I turn the gain down, it sounds thin and harsh. It seems like the low frequency is become more or less muted while the highs gain is still on 10. Any idea? Is it possible to get a schematic for this amp? Hi Kurt, this could be a number of things. Firstly, what type of music and guitar are you using? Secondly, it could be a tube thing – it’s probably a well-used amp, and has probably seen a lot of action. To this end, it could be worth taking it to a tech for a check-up. Hope this helps a bit, and let us know how you get on! And if you’ve got more questions, we’re always happy to share our knowledge on here, so give us a shout any time. I am wondering if I can put KT 88 in my trilogy amp. And only put 2 tubes so I get lower watt. Will have to bias the amp then? Hi Bjørn. The Trilogy does not feature the TSC-autobiasing system, so the amp has to be modified and biased by a qualified tech who is specialized in tube mods. Please contact a local tube expert for this! I was just curious if I could put kt88’s in my switchblade 100 head. I really need to get new tubes and i was wondering if this would cause problems at all. I think there is someting wrong on your support site, mails are comming back. My question is wich scews I have to take out of a H&K Tubemeister combo to replace the speaker? Thanks for the support. Hi Peter, and thanks for letting us know about the issue with the emials bouncing back. We’re looking into it! I am settling in for the Tubemeister 36 at the moment, but eventually would like to upgrade to the Grandmeister. I was wandering with the Tubemeister how to operate this amp using a footswitch to go from the Clean to Crunch and then to the Lead. I already have a (Midi FSM 432 MK2). But would rather just use a smaller footswitch. Is there a footswitch out there to use that has 3 LEDs with each channel selected? And what is it called? Hi Dennis. Unfortunately, this wouldn’t work, especially for GrandMeister, which would would at least need a 4-way switch (for the channels). There are some 3-button switches out there, but we haven’t tested any (they’re all from other companies, as we don’t make one) and are not sure if they would work with our amps. Generally, standard footswitches should without issue, but until we test them, we don’t know! If you saw one you liked the look of, you’d have to contact the maker and ask them first. Sorry we can’t be more helpful on that point! I think it would be great too. While I’m here does anyone know if I can put kt88 power tubes in my Coreblade without frying it? Yes, you can, the Coreblade can handle any tube that fits into the socket 🙂 Hughes & Kettner officially “allows” EL34 and 6L6, but we know that Michael Wilton used KT88 on tour. The Coreblade will always be fine. The only thing that may happen: the anode fuse may blow if there is a bad tube and TSC does not habe the time to measure (can only measure properly when tubes are heated up). habe mir vor vielen Jahren die RED BOX PRO Order Nr: 123033 gekauft,nun meine frage kann ich einen zweiten Tub Amp aus dem XLR Ausgang ansteuern ohne meinen ersten Amp zubelasten. I’ve just received my GrandMeister 36 and I am very happy with it. I played with it and noticed after a couple of hours the top of the amp gets very hot (too hot to touch). The bottom seems fine. Obviously it is the heat of the tubes rising up, no surprise there. I do find it a bit unnerving for it to get that hot. Is this normal? I’m probably going to put a little fan on the back to get some airflow going. I found the preset list on your website. It covers the first 68 presets, any chance you can upload the full list? the heat is normal. Unlike tube amps with wooden housings, the metal case works as a heatsink and just feels hotter than wood. Inside, the amp is cooler than most other amps. No worries, no active cooling needed, just do not cover the amp. Regarding the preset list, the GrandMeister comes with 68 different presets, the rest of the preset memory contains copies, testing sounds and empty slots. You can overwrite everything above 68 without losing any factory preset. He comprado el H&K tubermeister 18 combo y tengo una duda técnica. Cuando doy al reverd al máximo nivel me produce un ruido de fondo en el amplificador, aún con el volumen cerrado. Creo que esto no es normal. Quiero saber si puedo devolverles el equipo por otro que no tenga este defecto. Además, el catálogo que me han enviado no está en español ni es el del equipo. Me ha venido con el pedido el catálogo del cabeza y no del combo. I read on FaceBook that GM36Remote will allow saving/sharing of presets. I’m hoping this website will have a place to post presets. This will be a great communication tool for us H&K owners/fans. Keep up the great work guys!